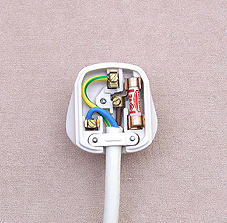 The wiring from your fuse box for all you household circuits is hidden behind walls ceiling voids etc. This cable is called "twin and earth" cable. If you have old electrical wiring your colours will be different from current colours. There may be times when you need to know what colour is live. So, for OLD electrical wiring red live black neutral. So the new colours are the same as you will find on your appliances when changing a plug.